This is one of the most popular dishes in east and north-east India. In celebration and special occasion menus this features regularly. 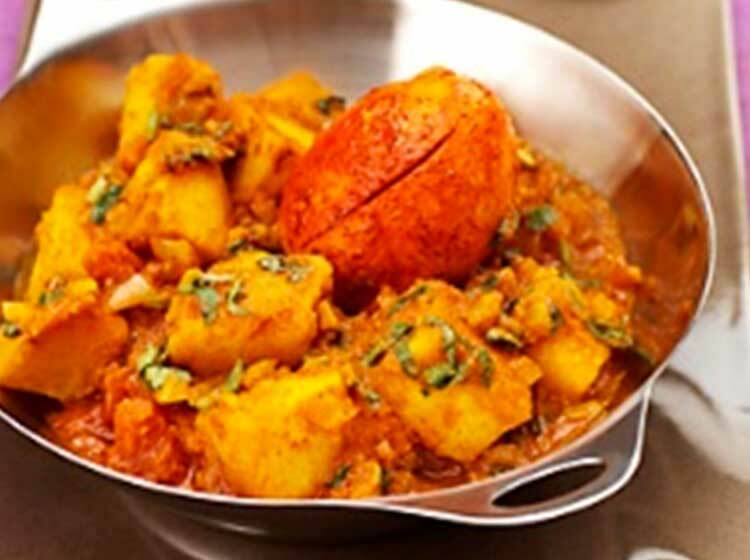 Both the eggs and the potatoes are sautéed with a touch of spices until they form a light crust then simmered in the fragrant sauce. Shell the eggs and make 3-4 slits lengthwise on each egg leaving a little gap on either end. Reserve half teaspoon each of the chilli powder and turmeric and mix the remainder together. Peel and cut the potatoes in 2.5cm chunks. Chop the onion finely. In a heavy based saucepan, preferably non-stick, heat half the oil over a low-medium heat and add half the chilli-turmeric mix. Follow quickly with the eggs and turn them around in the pan until they form a light crust. Remove them with a slotted spoon. Add the potatoes to the oil left in the pan and raise the heat to medium-high. Sprinkle the remaining chilli-turmeric mix and sauté the potatoes until they are brown and have formed a crust. Remove with a slotted spoon. Reduce the heat slightly and add the remaining oil to the pan. Add the cardamom and cloves and let them sizzle for 25-30 seconds then add the onion, ginger and green chillies. Cook until the onion is light brown and add the coriander, cumin, and the reserved turmeric and chilli powder. Cook for about a minute and add the tomatoes and their juice. Continue to cook, stirring frequently, until the tomatoes are reduced to a thick paste and the oil begins to seep through the surface (7-8 minutes), reducing the heat to low towards the last 2-3 minutes. Add the potatoes, salt and 225ml warm water. Bring it to the boil, reduce the heat to low and cover the pan tightly. Cook until the potatoes are tender, stirring occasionally. Next, add the eggs and simmer, uncovered for 4-5 minutes, stirring occasionally. Stir in the coriander leaves and remove from the heat.